MPA is one of the postgraduate qualifications offered by the Central Queensland University (CQU), Australia. CQU is one of Australia’s most engaged, supportive and responsive universities, focused on making higher education and research more accessible and relevant to all people especially attracting and servicing international students. It is creating the next generation of leaders and change makers and recognized by Times Higher Education as one of the Top 2% of universities (Worldwide University Ranking 2019) and Australia’ first and only Ashoka U Changemaker campus driving social change. CQU offers MPA programme on campus and online as well. The course is conducted in Brisbane, Melbourne and Sydney and online for domestic and international students. This programme is much popular among the students who are interested in employment in Accounting and Finance. After completion of the programme graduates potential fields of employment include financial accounting, management accounting, taxation auditing, teaching, finance, banking management, administration, consulting and business advisory services. The Master of Professional Accounting is accredited by CPA Australia. As a graduate, you are eligible to apply for an associate membership with CPA Australia and can commence studying the CPA Program professional level examinations. On completion of the CPA Program and three years of mentored professional experience, graduates may progress to CPA membership. The CPA Program can be completed online from anywhere in the world. The program will allow students to complete two different Master’s degree programs in two world recognized universities at the same time. 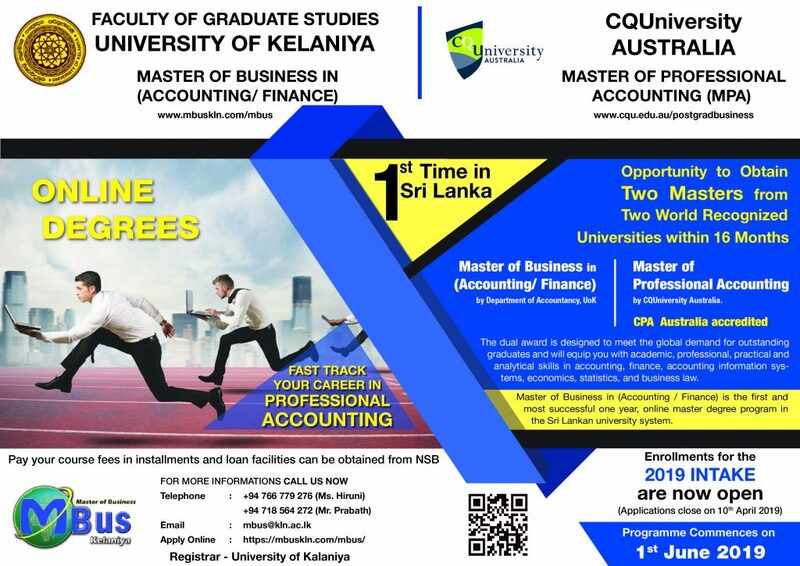 With this dual degree programme, the students are having an opportunity to obtain Master of Business (Accounting/ Finance) from University of Kelaniya, Sri Lanka and Master of Professional Accounting (MPA) from CQU Australia. Both these degree programs are conducted on online mode and students will have experience in e-Learning and m-Learning blended exposure. 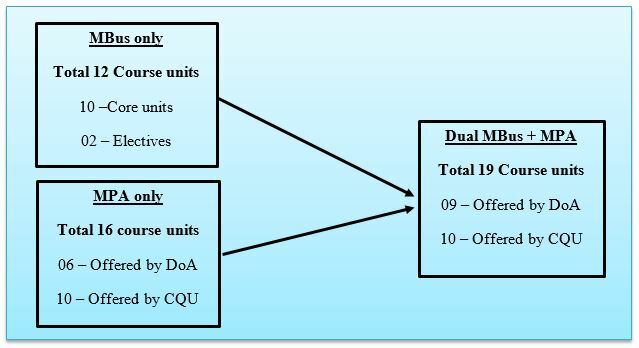 All lesson materials are prepared by well qualified lecturers in both universities, available online 24/7 basis and student progress is tracked under a continuous assessment process. 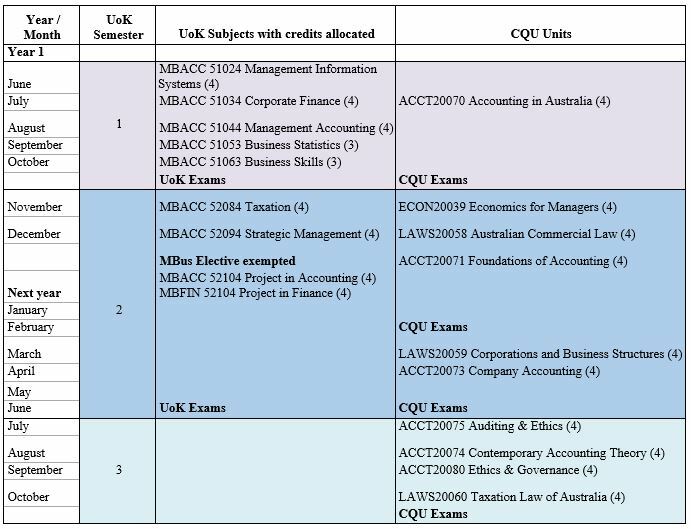 The proposed course units and credit requirements to offer the dual degree of MBus in Accounting and MPA are mapped in the Table 01 and 02 below (Please refer to appendix 01 for more information).